Mix together chili powder, cumin, oregano, parsley, basil, salt, and pepper; coat fish with seasoning mixture. Add oil to a large skillet and heat over medium. Add fish to pan and cook 4-5 minutes per side until flaky; remove from heat and shred. Bake taco shells according to package directions. Chop tomatoes and avocado. 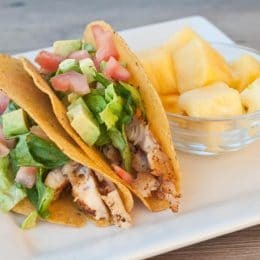 Fill each taco shell with fish, lettuce, tomatoes, and avocado. Serve with pineapple on the side.